Former Rep. Beto O'Rourke (D., Texas) said he's still dealing with "exhaustion" from losing his Senate race to Ted Cruz (R., Texas) and is possibly months away from deciding whether to run for president. "There’s an exhaustion after an effort like that, that I’m learning is hard to recover from," O'Rourke said at a local speaker series in El Paso, according to Politico. "You don’t snap back." At the event, he responded to a questioner that he was looking at teaching if he doesn't run for higher office. He told Politico that deciding to enter the increasingly crowded 2020 field could "potentially" take months. 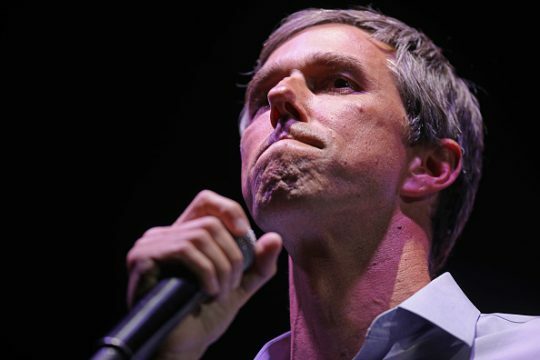 "There are people who are smarter on this stuff and study this stuff and are following this and say you’ve got to do it this way or get in by this point or get in in this way if you were to get in," O’Rourke said. "I think the truth is that nobody knows right now the rules on any of this stuff. I think the rules are being written in the moment." O'Rourke has earned attention, and more than a little derision, over the past few weeks as he pens Beat Generation-style Medium posts detailing his road trip through the American heartland. In one entry, he confessed to being "in and out of a funk" since leaving Congress on Jan. 2. One CNN reporter wrote O'Rourke's "excellent adventure drips with white male privilege." He also gave an interview to the Washington Post that was light on details for his plans on issues such as illegal immigration, saying he trusted the "wisdom of the people." In the same interview, he questioned the relevance of the U.S. Constitution to lead "an empire like ours." O'Rourke received adoring media profiles and national progressive attention during his run to unseat Cruz, but he ultimately fell short by three points. Although he said during the campaign he would not run for president, win or lose, he said after the loss that he and his wife were considering it. He even met with former President Barack Obama, stoking speculation that he was considering the plunge.